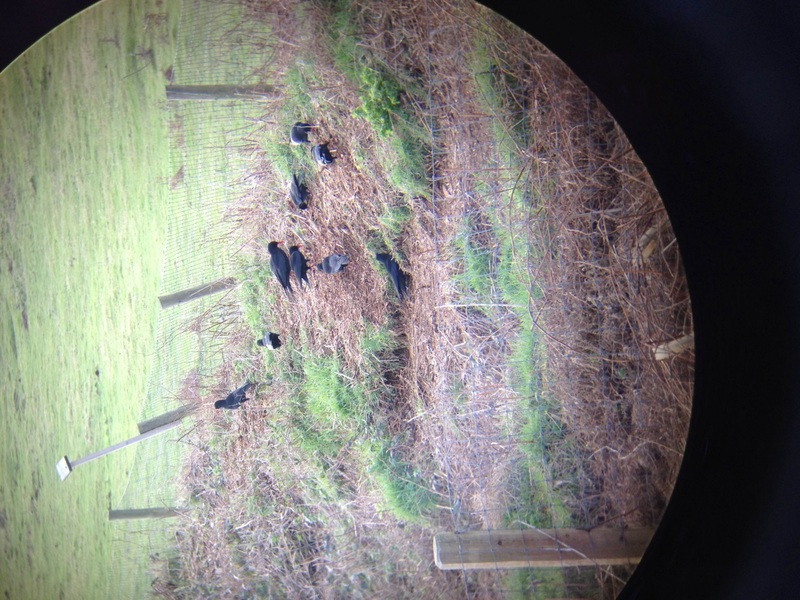 January was another relatively quiet month for the choughs, partly due to the many wet and windy days on the north coast. The team continued with the radio-tracking study as usual, but often found the birds weathering the storm in the shelter of the aviary or quarry buildings. Therefore, occasions when the birds were found foraging in a new field or section of cliff were met with glee by the tracking team. 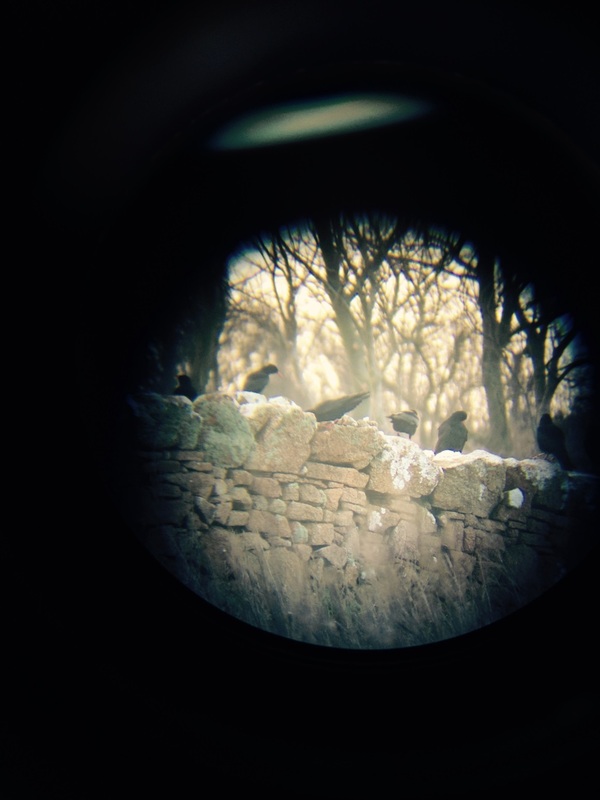 Whilst the birds did not travel any further afield this month, they continued finding new areas to investigate, including the dirt bike track, dry stone walls and the edges of ploughed agricultural fields close to the coast. New student Daniel practising colour ring re-sighting as the choughs probe in the aviary field. Photo by Harriet Clark. 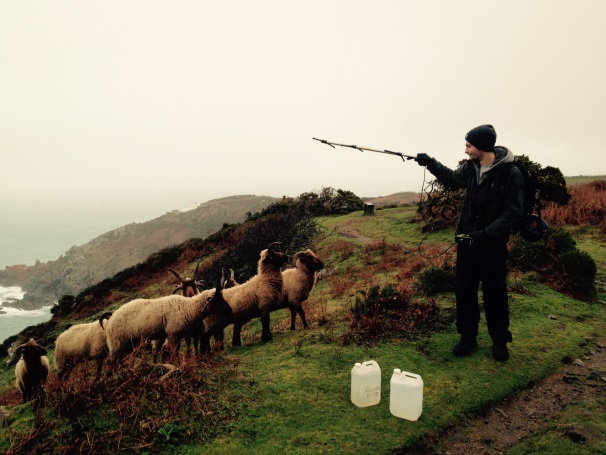 The start of the New Year saw us welcoming a new member to the chough team, Daniel Loveard. Daniel is an environmental conservation student at Bangor University, and is spending his placement year gaining practical experience in bird conservation and developing his field skills. Just weeks before arriving in Jersey he was volunteering on a parrot conservation project in the Caribbean, so the wintery conditions at Sorel were undoubtedly a bit of a shock! He spent his first few days learning how to radio-track and identify the individual birds by their colour rings. This was particularly tricky when there is the added challenge of trying to hold your binoculars steady in the wind! 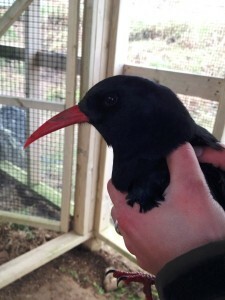 Details and information on how to apply for a placement on the chough project can be found here. 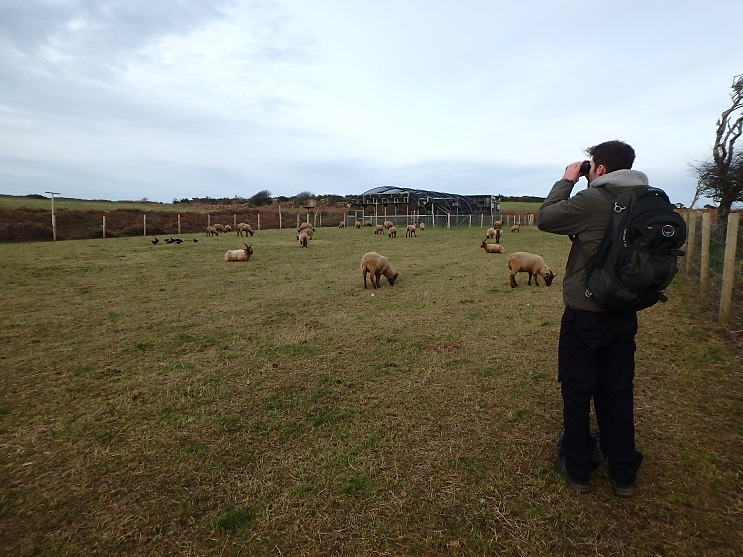 In December the flock of Manx loaghtan sheep at Sorel were confined to the aviary field due to several of the younger sheep falling ill. Fortunately the flock recovered well, and the older stock was released back onto the north coast in January. 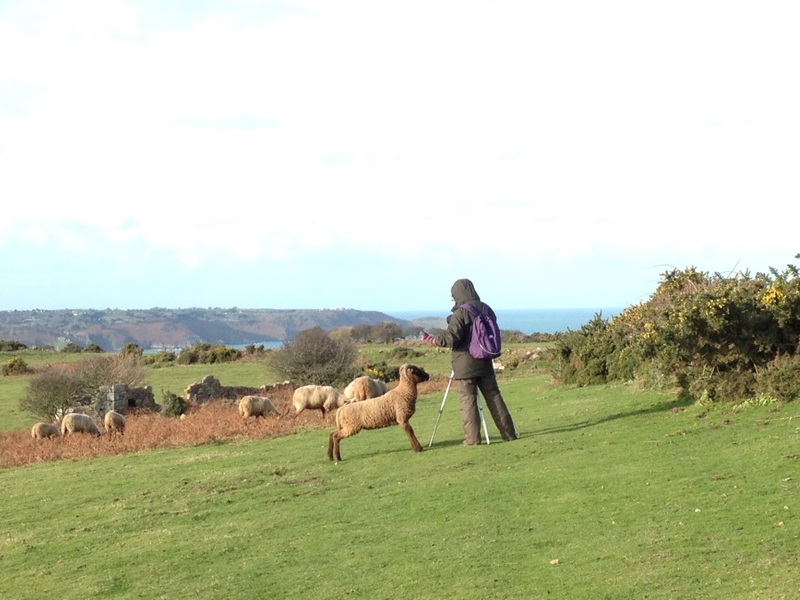 Since then the sheep seem to have grown quite attached to the tracking team, greeting them as they arrive in the morning, following them as they radio track the choughs, and showing great interest in the contents of the insect pitfall traps! 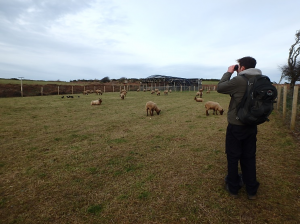 The sheep certainly provide company during long days up on the cliff tops, but more importantly play a vital role in the Birds On The Edge project, as they help open up scrub landscape and increase biodiversity. 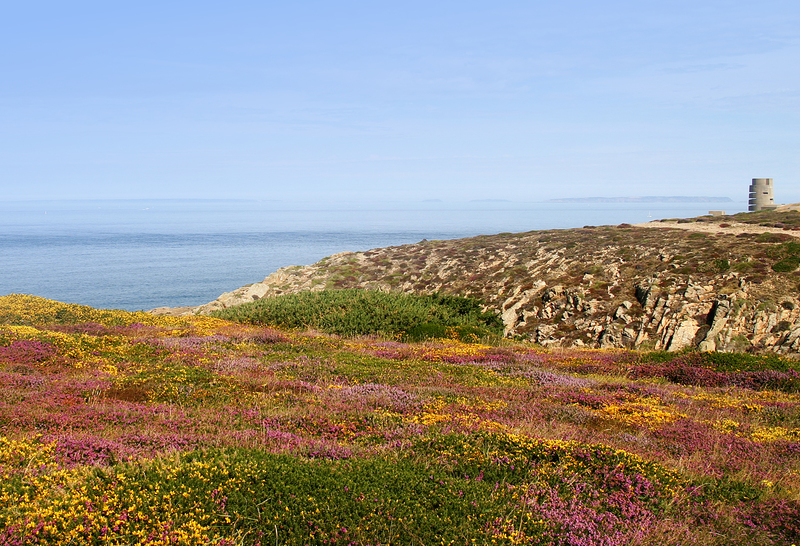 Their extensive grazing determines the structure and floral composition of the vegetation, so we are very grateful to local botanist Anne Haden for carrying out surveys across the site to record the diversity of plants present. Anne maps the plants found at the eight randomly selected pitfall trap sites, and submits her records to the Jersey Biodiversity Centre. A personal favourite so far is the unassuming looking but aptly named Sheep Sorrel! Handsome Green; the mud stains on his beak are evidence of many hours spent probing for insects. Photo by Jennifer Garbutt. Towards the end of the month we fitted one of the oldest birds with a new radio transmitter. All of the birds carried transmitters before they were released in 2014; however, the sub-adult group moulted in June losing their transmitters in the process. We did not see a need to reattach them once their tail feathers had grown back, as the group was relatively predictable in their movements and returned to the aviary on a daily basis allowing us to easily keep an eye on them. However, with spring approaching, the oldest pairs may break away from the group and start looking for nesting territories. 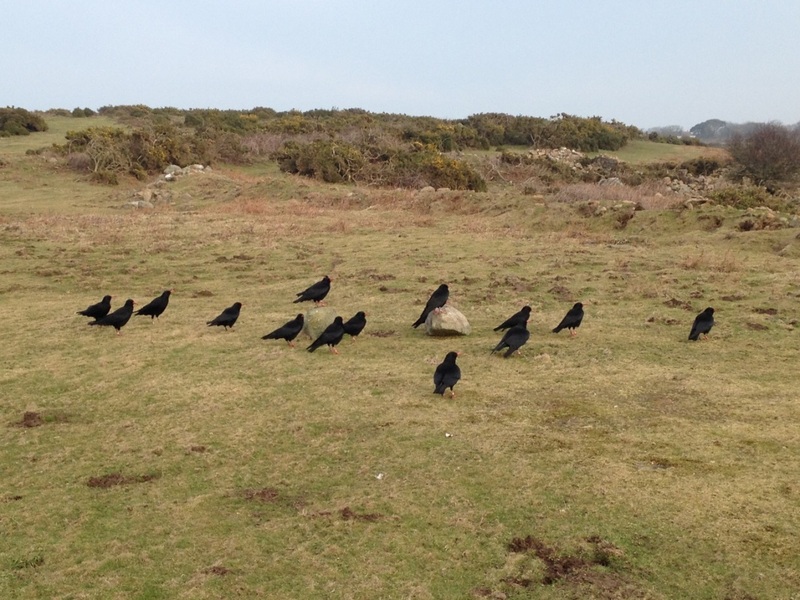 Choughs reach sexual maturity at three-four years old, so four year old Green is the male most likely to set up a territory and there appears to be a strong pair bond between him and four year old female Blue. So, with high hopes for the breeding season, we decided to fit Green with a radio transmitter, enabling us to closely monitor the pair’s behaviour and track their movements. On a dry but very cold day, armed with plenty of hand warmers, we caught Green up in the aviary and fitted him with a new transmitter. This also provided us with the first opportunity to check his condition in the hand since he was released eight months ago and obtain a blood sample to screen for any potential health issues. He appeared the picture of health and is maintaining his weight well. We also replaced his colour ring which had faded, making identifying him at a distance or in poor light considerably easier. 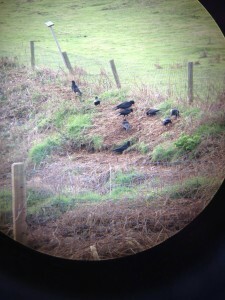 Fingers crossed we will have some nesting activity to monitor in the coming months! Thanks. Watching with interest from Cornwall.